Perjury charges should have been brought against members of the RUC (now PSNI) police over the plastic bullet killing of an innocent mother of three, senior judges ruled in Belfast yesterday. Sinn Fein has published its manifesto for next week’s British general election based on the linked policy objectives of peace, equality, jobs and Irish unity. Republicans have been urged to take part in a protest march “Enough is Enough” against bank bailouts which will be taking place Tuesday evening 11th May in Dublin. Loyalists have said they will protest against a republican hunger strike commemoration, which is to pass through Belfast city centre en route to the west of the city. Gordon Brown’s chances of retaining the position of British Prime Minister plunged this week after a stunning gaffe on the election campaign trail in which he was heard dismissing a voter who questioned British immigration policy as ‘a bigoted woman’. The foreward by Sinn Fein President Gerry Adams to the party’s manifesto for next week’s Westminster election. Tactical voting is part of the electoral landscape of the six counties and when done for progressive reasons it strengthens the nationalist democratic forces for progress and weakens the undemocratic forces of unionism. Britain has apologised to the Vatican for a memorandum by a team of civil servants at its foreign office mocking Pope Benedict ahead of his scheduled visit to England in September. 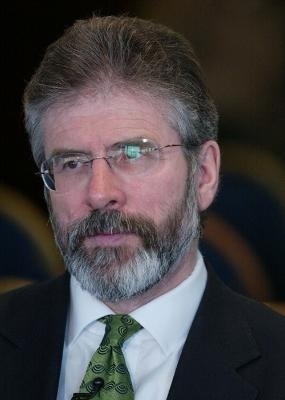 Sinn Fein President Gerry Adams clashed with a prominent republican on Sunday as he canvassed in south Tyrone. Sinn Fein, the SDLP and the DUP have criticised comments by British Conservative leader David Cameron which compared the north of Ireland to a former Soviet nation. Six Eirigi protesters including Dublin city councillor Louise Minihan locked themselves inside the headquarters of Anglo Irish Bank in Dublin on Saturday morning. Unionist paramilitaries carried out an attack on the home of a woman in the Shore Road area of north Belfast at the weekend. Regardless of who won in the debate between the British party leaders last Thursday, the outcome points to one clear conclusion: there will be a hung parliament in Britain. Imagine, for a moment, that we are in the 1890s. It is not as big a stretch as it might seem. 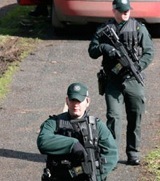 The PSNI police base in Newtownhamilton, County Armagh, was struck by a bomb attack late tonight. A shock announcement that Sinn Fein’s Alex Maskey has withdrawn from the Westminster election in south Belfast was greeted with only hostility by the main beneficiaries of the move, the rival nationalist SDLP. 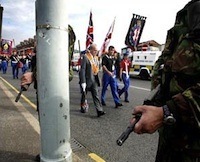 Proposals to create a revised system of dealing with sectarian parades that would replace the Parades Commission were published this week by Six-County First Minister Peter Robinson and Deputy First Minister Martin McGuinness. The budget deficit of the 26-County state is now the highest in the euro zone, according to the latest figures from the European Union, outstripping near-bankrupt Greece to become the state facing the greatest budgetary crisis in Europe. A prisoner at Maghaberry jail has said those who took part in an Easter protest at the jail continue to be kept in lockdown for 23 hours a day. With just two weeks left in the campaign, a hung parliament is the likeliest outcome of the British general election, according to the latest polls. Sinn Fein are asking the electorate to endorse our role in leading the way in significant political developments since the last Westminster election. If, as a result of vote-splitting or diffused voting, a disproportionate number of unionist MPs are elected you can be sure that this will be flaunted to demoralise the nationalist people. 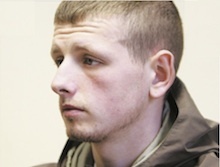 A republican ex-PoW has been re-imprisoned after the British government claimed that he was “a danger to the public”. The PSNI mounted a military-style raid and arrest operation in north Belfast on Saturday which was described as ‘aggressive’ by local residents. Martina Anderson can become the first Sinn Fein MP for Derry in more than 80 years, Sinn Fein President Gerry Adams has said. 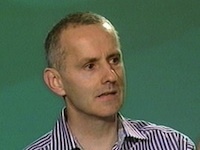 Former Sinn Fein publicity director Danny Morrison is unlikely to receive compensation for years spent in jail because he has not shown himself to be “demonstrably innocent”, according to the British government. The senior coroner in the North has criticised the PSNI over its latest excuse for refusing to pass on files related to controversial state killings and assassinations. The story of Padraig Pearse and the rebellion of Easter 1916, 94 years ago this week. It cannot be easy being a republican political prisoner in the North these days. The Dublin government is to flatten housing developments across the 26 Counties in a desperate bid to reinflate Ireland’s property bubble. 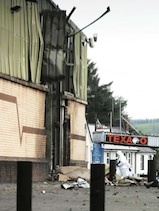 Doubts have been cast on the ‘Real IRA’ claim of responsibility to the BBC for the bomb attack at the heavily-fortified Palace Barracks in County Down on Monday morning. The SDLP has rejected Sinn Fein’s request to counter the challenge by a united unionist campaign to oust two sitting nationalist MPs from their Westminster seats. Tory leader David Cameron yesterday said he would seek to bring the north of Ireland into what he called the “mainstream of UK politics”. Unionist politicians will hold the balance of power on Stormont’s new justice committee with a one-person majority, it has emerged. The last letter written by Kevin Barry the night before his execution is to be auctioned to the highest bidder in the latest sell off of Irish heritage. Sinn Fein President Gerry Adams this morning launched the party’s election campaign for the Westminster election on May 6th. 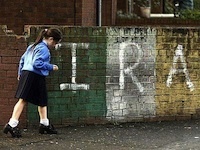 Elections here always throw up the worst excesses of tribalism among unionists. 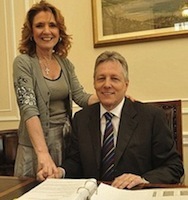 The Ulster Unionist Party, the DUP and the British Conservative Party have agreed to back a “unionist unity” candidate in next month’s Westminster election in an effort to unseat Sinn Fein’s Michelle Gildernew from the seat famously won by Bobby Sands in 1981. Hundreds of family members and supporters of republican prisoners staged a protest outside the gates of Maghaberry jail yesterday [Sunday] amid calls for an international human rights observer to see conditions in the prison first hand. Victims of state killings and collusion have expressed suspicion at plans to shut down a specialist police unit set up to investigate unsolved killings from the conflict. 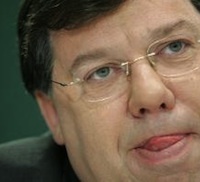 The 26-County Taoiseach Brian Cowen has threatened public sector workers with another eight percent pay cut if they reject the agreement negotiated with union leaders at the end of last month. Justice for the Forgotten, the organisation that represents victims of the conflict in the 26 Counties, says it will close its doors in June unless the Dublin government commits renewed funding to complete its work. The Felons’ Club on Belfast’s Falls Road in an exhibition of republican memorabilia organised by the National Graves Association. The bomb that went off near the MI5 headquarters in Holywood last night didn’t do much damage but it does bring into focus a number of issues. In a historic step, the Belfast Assembly this afternoon chose Alliance leader David Ford as the first Six-County Justice minister in nearly forty years. A major bomb detonated earlier this morning outside the British Army’s Palace Barracks in Holywood in County Down, east of Belfast. Tensions continue to escalate inside Maghaberry Prison today after republicans were ‘disciplined’ last night for taking part in a 48-hour protest at prison conditions. The Dublin governmment, through State-owned Anglo Irish Bank, is to give 700 million euro to Quinn Insurance following the latest major collapse in Ireland’s humbled financial industry. Thousands of republicans attended scores of rallies across the island of Ireland last weekend to commemorate the 1916 Easter Rising. After weeks of spin and damage control, British Direct Ruler Shaun Woodward has confirmed a further delay in the 38 year campaign for truth and justice by the relatives of those killed and injured on Bloody Sunday. 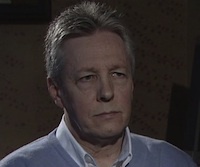 An extraordinary BBC interview with DUP leader Peter Robinson has stoked the growing controversy surrounding the Robinson family and its financial dealings. A new residents’ group in north Belfast has said it will resist any future sectarian parades through the nationalist community in the area. 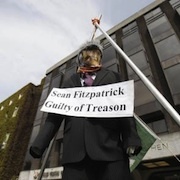 A number of statements were issued by the main republican organisations at the weekend. For years at election time Robinson was the DUP’s Wizard of Oz. Now, when the party needs him most he’s exposed as a diminutive political figure behind a curtain. British prime minister Gordon Brown has today called a general election for May 6th after visiting Buckingham Palace to seek Crown permission to dissolve parliament on April 12th. Republican prisoners barricaded themselves into a dining hall yesterday evening at the North’s highest security jail in an escalation of conflict between republican prisoners and the regime in Maghaberry Jail. North Belfast republican Terry McCafferty has been released from Maghaberry Prison fifteen months after he was summarily jailed. A brother of former IRA leader Brendan Hughes has said his family are angry at suggestions by Sinn Fein President Gerry Adams that he was mentally ill when he gave interviews about his past. Sinn Fein’s Martin McGuinness has called on Peter Robinson to provide an explanation of new revelations about a transaction with a leading property developer. 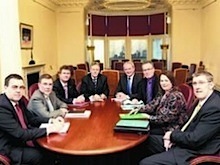 The DUP said on Tuesday that plans for a Bill of Rights for the north of Ireland should be scrapped. 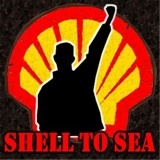 25 out of 27 people prosecuted for resisting Shell’s experimental gas pipeline have cases withdrawn or dismissed. I too, this Sunday, will remember with pride those IRA members I knew who died young so that we could live in a united and free country.